Develop your management and leadership skills. 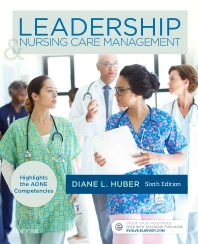 Leadership and Nursing Care Management, 6th Edition maintains its AONE competencies, and features the most up-to-date, evidence-based blend of practice and theory related to the issues that impact nursing management and leadership today. A fresh, conversational writing style provides you with an easy-to-understand, in-depth look at these prevalent issues. Key topics include the nursing professional's role in law and ethics, staffing and scheduling, delegation, cultural considerations, care management, human resources, outcomes management, safe work environments, preventing employee injury, and time and stress management. UNIQUE! Chapters divided according to AONE competencies for nurse leaders, managers, and executives. Research Notes in each chapter summarize relevant nursing leadership and management studies and highlight the practical applications of research findings. Case Studies at the end of each chapter present real-world leadership and management situations and illustrate how key concepts can be applied to actual practice. Critical Thinking Questions at the end of each chapter present clinical situations followed by critical thinking questions that allow you to reflect on chapter content, critically analyze the information, and apply it to the situation. Full-color design and photos makes content more vivid.